32North Stabilicer Lite Hiker ice cleats combines all the great design and construction features of our best-selling Lite model, yet now provides enhanced fit and performance for deeper snow conditions with the addition of Velcro performance fore straps. 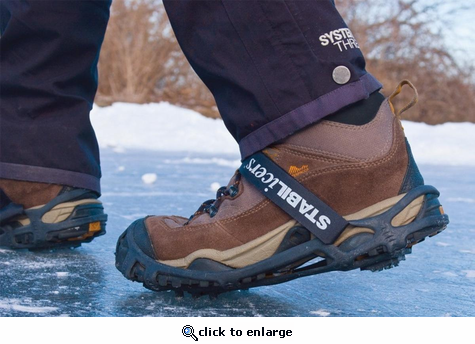 For walkers, hikers and other winter athletes, these simply mount to the bottom of your shoes, reducing the chance of slips and falls. Case hardened steel ice cleats are multidirectional for aggressive traction. Bought 2 pair. They really bite on the ice. Take baby steeps getting to the ice. Better then anything I have bought in 11 years here in Montana. Have been using the regular yaktrax with the roll springs on the bottom, fine for just snow. But we've had ALOT of ice lately so I bought these. Let me tell you they're just what the doctor ordered (luckily haven't need one once I started using these). No more shuffling, scooting or walking like a penguin. I raved about them so much, my whole department ordered some. ProsGrips the ice like a pro. Does not tear up carpet indoors. Great value. ProsGreat Price. Cleats as advertised. ConsOrdered two sets at the same time. A day later, was advised that one set had shipped, and the other had not. No indication of which set (different sizes) was which. Called the customer service number and left a message. NEVER heard from them! Got each set about a week apart. Stabilicers allowed me to safely take my dog to the dog park that had turned into a skating rink due to thawing/freezing; the grip was great. I felt they ran a touch small as I put the size small on my women's size 7 boots with a fair amount of effort and the stabilicers were rated for women's size 5-8. I'm glad I can leave them on these boots, because I wouldn't take them on and off all the time.